Need an easy and quick way to contact parents and/or students? 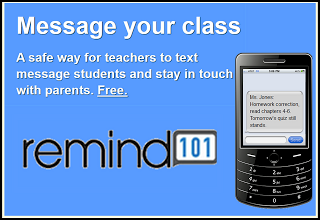 Remind 101 is a website and an app where parents and students can subscribe and you can text reminders without exchanging any phone numbers. I set up my entire account through the iPhone app. I haven’t even checked out the website. It’s so simple! You are assigned an unused phone number. For each group (I did mine by class period), you are given a code. Group members text their code to number to subscribe to your messages. Standard texting rates apply. They can easily unsubscribe at any time without the teacher having to do a thing. If anyone tries to text the number, a message comes back saying that messages cannot be sent to that number. If anyone calls it, a message reports that it’s not a working phone number. For now, this service is free, but it wouldn’t surprise me if that changes before too long. Get your account now! I first learned of this app at the AVID Summer Institute in Dallas and have been waiting all summer to create my classes :). This app may just change my world! I keep track of graded voluntary participation points on my seating chart every six weeks and expect students to get the class average (I figure out what the average number of points each class has) for a 100%. Anything less than the class average is scaled down from 100 to 70. In an effort to not kill shy people’s grades, the lowest grade I give for being in class and participating without volunteering is a 70%. Class Dojo allows you to keep track of whatever you want digitally. You can have multiple categories that offer opportunities to let parents and students track progress. The Demo Class comes with the following categories: participating, being on task, working hard, off task, unprepared and talking out. 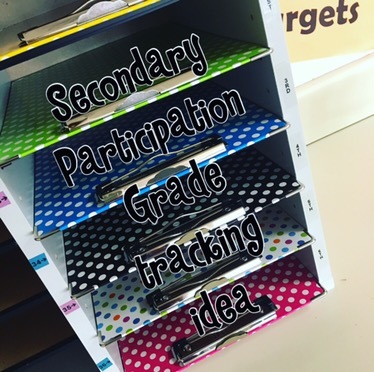 For my purposes, I plan to only track of participation points; however, I can see how elementary teachers may be able to utilize other categories as well. To setup a class, create an account (the account can be created within the app or on the website), login to the website, and copy and paste a list of names, each name on its own line. Once the class is created, you can create/delete categories. And… It has a random feature! I am excited for it to help me call on a more random selection of students. I once created notecards to do it, but this is much more efficient and saves paper! Have you heard of Erin Condren? You may hate me in a few seconds if you watch the video below. My kindergarten teacher cousin introduced me to this planner, and it was love at first sight. I seriously want to purchase everything on this site. It’s ADORABLE!!!! For now, I have only ordered my personalized lesson plan book. It arrived yesterday and is everything I expected and more! I highly recommend getting the extra check-list pages (I don’t keep records, but I plan to use them as additional notes pages), the personalized notepads (I attached mine in the front of my planner) and the pen clip. The front and back covers are thickly laminated and the interior pages thick and sturdy–no worries about accidentally ripping some as you flip. In case you don’t want to watch the 10 minute video from her site, scroll past it for a 2-minute picture slideshow of my 2013-2014 lesson plan book.